« Exchange 2007 SCW and Windows 2008 SP2? If we look at the development of OWA that every release of a new version of Exchange, we get all the more and more close to the desktop version of Outlook!, it is very cool and a developers team really need to say a huge thanks for their work! Respect! Thanks for the review “send as”! yes it’s a good thing, for sure. 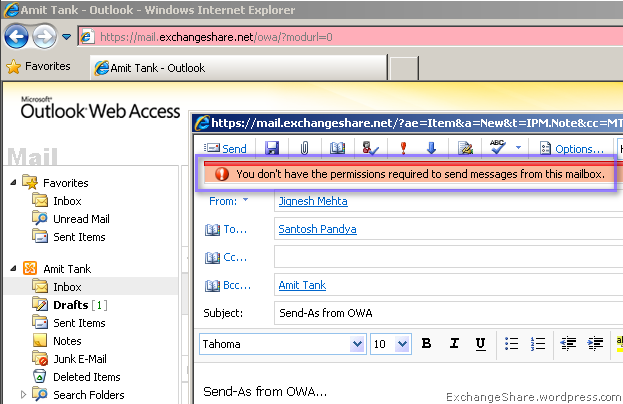 But, when will it be possible to delagate “send as” and “send on behalf” permission from OWA ?? still waiting for this important feature don’t you think ? On a related note I was wondering if its possible in 2010 OWA to grant users read and or write permissions to different folders of their mailbox like Inbox, Calenders etc? Much like proxy access in Groupwise?